Essays and travelogues about Medieval France and Italy, focusing on the legends of Charlemagne as well as an occasional post on anything else that strikes my fancy. I am now home safe and sound from my trip to France. It was exhausting, but very rewarding. I didn't have the computer access that I had hoped, so I wasn't able to blog while on the trip. One of the goals I had was to find out what I could about obscure saint that I had stumbled across while doing research for my novel. According to Catholic.org there was a saint who had at one time was a soldier for Charlemagne who left his military career and devoted his life to his faith and was a hermit. His name according to that website was Namphaise, but also known as Nauphary, Namphrase, and Namphisius. I wasn't surprised by different variants of the name for many other saints depending on which language is used. For example Saint James in French becomes Saint Jacques. 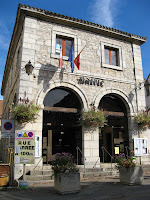 The first place I went was the town hall in the village of Saint Nauphary. I was curious to hear what they had to say about their namesake saint and was hoping that they might have something worthwhile taking a photo of such as a statue, painting, etc. I showed a print out of the Legend of Saint Namphaise that I had found on Quercy.net. I gave her the French version and not the mangled automatic English translation version. She shook her head and told me that this story wasn't about Saint Nauphary and she underlined the portion of the page that said Namphaise and the towns he reportedly had lived in. I tried telling her that Nauphary and Namphaise were the same man, because I read that on the internet. Unfortunately I couldn't guide her to the correct page on Catholic.org which would show where I came upon that information. She then said Nauphary was from the tenth century and had lived in Moissac. She brought out a book which gave his official history and with a little prodding, I was able to get her to made copies of that book for me. This was all done in French. I took lessons for a year to prepare for the trip, but I am far from fluent in the language. In fact, I think of it as speaking hacked up French. Some of my conversations with French people were done with us meeting each other on some form of common ground where those who had a familiarity with English spoke what they could and I would meet them halfway with my knowledge of some French words and trying my best to pronounce it with some level of correctness. I was glad that I brought in the print out to the town hall, for it would have been impossible for me to convey the history of this saint without that help. I walked out of the room realizing that poor Saint Nauphary's history is being blended online with someone else who lived two centuries before him. Hopefully I'll be able to get that changed in the near future by connecting the woman from Saint Nauphary's town hall with the webmasters who have sites about the Catholic saints. The biggest thing I took away from that day of research was that my hermit saint is no longer named Nauphary, he is Namphaise. It was on another day that I went in search of sacred sites associated with Saint Namphaise. I knew from previous websearches that the town of Marchilhac-sur-Célé had an ancient abbey and had seen photos of it. I also was reasonably confident I could find the tomb for Saint Namphaise in the town of Caniac-du-Causse. It was finding the monastery that the badly translated English version describing as having degenerated into a "convent of chocolate éclairs" that I was really interested in finding. It seemed an impossible task, but then I looked again at the legend and saw a clue. There was a reference to Lantouy and the Lot valley. 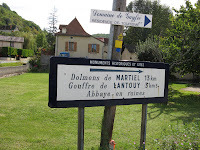 There was no town of Lantouy listed on my comprehensive Michelin map of France. However, when I scoured the map near the Lot River I saw the words "Gouffre de Lantouy," a symbol for ruins, and the word "monastère." Gouffre means "gulf or abyss" in French. I highlighted that area on the map and hoped we could find it. The Michelin map was fabulous because it was so comprehensive, however, there are many, many roads which simply aren't well marked on the map or in real life. My husband and I began referring to the smaller roads as paved goat paths. Some were large enough to accommodate two way traffic, some weren't. I also knew that this historical landmark would not be listed in our GPS unit. We were on our own to try and find it by map and by luck. 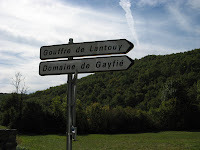 I decided that the best thing to do would be drive to the nearest large town and ask their tourist office if they knew of the "Gouffrey de Lantouy." So we drove to Cajarc and found that the tourist office was closed until 3 pm that day. Undaunted, I went to the town hall. I showed a woman the print out regarding the legend of Saint Namphaise and she nodded. She spoke in rapid French, but it was evident that she knew about it! She wrote down directions of how to find the Gouffrey de Lantouy. I left the office feeling excited. We followed her directions and soon saw the first sign telling us that indeed the site I sought was marked. The words "Abbaye en ruines" made me feel optimistic. Further down the road we saw another sign directing us to turn right. Then we saw a sign announcing the site. It was a bit, umm, unimpressive. The sign was rusted and bore signs of having been used as target practice. There was no one else around. No one was asking us for Euros for admission to an historic site. In fact, besides the sign there was only a trash bin for communal trash pick up and a large area perfect to park our car. That and a small worn path to follow. We weren't sure if this indeed was the place we sought and at first we drove on further but quickly realized after the road changed to a one lane gravel road that we needed to turn back and explore further the area around that footpath. 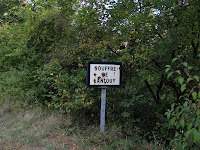 After walking across a small meadow we came into wooded area surrounding water and saw another sign. 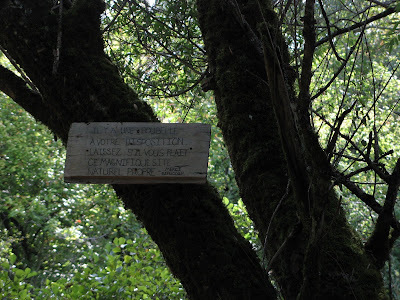 In my next post, I'll show you what I found including the Pit of Lantouy. Je suis un habitant du village de Saint Nauphary et j'ai été très enthousiasmé par votre récit bien que mon anglais soit assez pauvre et je crains donc de n'avoir pas tout saisi. Dites moi si je me trompe mais en résumé Saint Nauphary fut un chevalier qui combatit aux côtés de Charlemagne et qui par la suite se tourna vers la foi et se replia le reste de ces jours dans un monastère dans lequel il mourrut en hermite...Si cela vous est possible pourriez me donner plus de précisions sur ce personnage pour que j'en fasse profiter la communoté merci à vous. I'm the author of Quest of the Warrior Maiden, and Fate of the Saracen Knight. Volumes One and Two in the Bradamante and Ruggiero trilogy based on the legends of Charlemagne. Both novels are available in trade paperback and as ebooks. Download the KRCB Radio's Word by Word interview where I read several passages from the novel. Bonne Chance France en Coupe du Monde de Rugby!